Fifa president Sepp Blatter and vice-president Michel Platini should face sanctions from football's world governing body, says the panel investigating corruption allegations. The investigatory chamber of Fifa's ethics committee has sent its findings to the adjudicatory chamber chairman. Hearings are expected before Christmas. On Wednesday, Blatter and Platini - who both deny wrongdoing - had appeals against 90-day provisional bans rejected by Fifa's appeals committee. The reports and requested sanctions will not be published "for reasons linked to privacy rights and the presumption of innocence until proven guilty", said the investigatory chamber. It added its chairman, Dr Cornel Borbely, had withdrawn from proceedings against Blatter and Platini to avoid any appearance of a conflict of interests. Blatter and Platini were suspended in October. Blatter, 79, is accused of signing a contract "unfavourable" to Fifa and of making a "disloyal payment" to Platini. 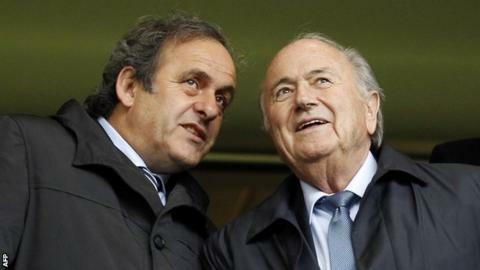 "Appeals by Sepp Blatter and Michel Platini against their 90-day suspensions were rejected earlier this week. Now Fifa investigators have concluded their final report. "Both men are under scrutiny over a £1.3m payment authorised by Blatter to Platini that Swiss criminal prosecutors have described as 'disloyal'. "Fifa ethics adjudicator Hans-Joachim Eckert must now reach a verdict on the cases. If found guilty, multi-year bans await. It would be a decision that would end the careers of both men in world football." Uefa chief Platini - who wants to succeed Blatter as Fifa president - has said the 2m euros (£1.35m) payment was "valid compensation" from his time working under the Swiss more than nine years earlier. They insist there was an oral agreement for the payment in 1998, although it was not made until 2011. Blatter and former France captain Platini were suspended after the Swiss attorney general opened criminal proceedings against Blatter, who has been Fifa president since 1998. The ethics committee also opened an inquiry into Platini over the payment. Platini's ban means his attempt to succeed Blatter has had to be put on hold. He is one of six candidates for the presidential election on 26 February, but no integrity check will be carried out until his case is resolved. The Frenchman has filed an "urgent" appeal with the Court of Arbitration for Sport (Cas). Blatter was discharged from hospital last week after what was described as a "small emotional breakdown". Earlier this year, United States authorities indicted 14 Fifa officials and associates on bribery and racketeering charges. A simultaneous Swiss investigation was started into the bidding process for the 2018 and 2022 World Cups.